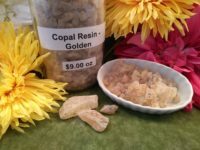 Copal is sacred to the indigenous cultures of the Central and South Americas. It is burned year round in churches and is best known for it’s extensive use in homes during Day of the Dead. It is said that the familiar scent of Copal helps souls find their way back for the annual visit home. Especially effective for ancestor altars, communication thru the veil, and meditation/astral travel. Medium to large grains, priced per ounce.